Our focus lies in empowerment. As a nonprofit, Hearts in Action is focused on building up young people and adults in the Peten with a sense of purpose and identity. Whether through formal schooling, creative experiences or greater opportunities for development and employment, HIA is engaged showing children and the community love and a future with hope. 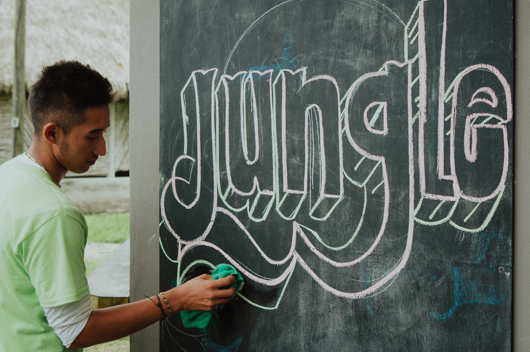 through The Jungle School, we are teaching hundreds of students, pre kinder through highschool. We also offer career training in eco-tourism, early childhood education and finances. TJS employs over 30 teachers and staff. Our setting is extremely rural surrounded by jungle and cattle farms. This area has had limited opportunities for formal education and economic development, but that is where we are a catalyst for change, and with your help, can make an even bigger difference in young lives. are gaining strength on the beautiful 650 acre reserve where Hearts in Action and The Jungle School educate and raise awareness. Resonating throughout the jungle is their moto, breath it, experience it, preserve it! HIA boosts biodiversity through organic farming, bird watching, aquaponics, permaculture and conservation efforts like restoration forests and recycling projects. We have water and waste management, sustainable forestry, school gardens and environmental training for locals and foreigners. like Itza Wood, a daring new design company and social enterprise is changing the atmosphere and infusing Hearts In Action with an entrepreneurial culture. Our goal is to inspire and educate as we create new start ups and workshops. Plans are in the works for exciting eco-tourism, gourmet foods, an educational toy company , and a honeybee business. These projects will bring economic incentives, belief in their dreams and more jobs to our students and the surrounding communities. We believe in change. And our process is rooted in listening to the people around us, focusing on using appreciative inquiry as a model that seeks to engage communities in self-determined change. Education can break the cycle of generational poverty throughout the world. Children are the best ground to sow seeds for righteousness, change and a brighter future. Sustainability comes from building each individual’s capacity to address their own needs and working together as a community toward creative solutions. Partnering with governments, communities, local organizations, and the private sector leads to success. Values-driven education offers a solid base for community growth and development. Integrity above all! Conservation and maintenance of our environment is crucial to life and healthy community development. Our values keep us aligned. Encourage love for our Creator and His creation. Take care of what surrounds you. Operate under a pioneering and creative mindset. Hearts in Action (HIA) is a 501(C)3 non profit, founded in 1987 by Mario and Suzanne Babarczy in Massachusetts. The organization began with local efforts educating children, then grew to larger meetings and international seminars on every continent. Initially we taught children and youth for ten years in schools, camps and churches throughout New England before moving to Guatemala. In 1993 we pioneered works and taught extensively in public schools, villages, orphanages, hospitals and youth jails. In 1996 the Guatemalan government asked us to develop new educational programs targeted at children and youth, focused on crime prevention, stopping sexual abuse of children and values training for schools. These programs went nationwide and continue to have a positive impact on the countries and the lives of the people involved. Since 1993, we have worked in hundreds of schools, trained thousands of teachers, and educated over 3 million children and youth in 5 countries through our programs and curriculum. In 1998, the founders traveled to the least reached, poorest department of Guatemala, the Peten. They experienced so much need among the local people and they felt compelled to respond. They purchased an abandoned orphanage in a remote village and the organization moved north to the jungle, far off the beaten trail. The founders had a sense that this overgrown, desolate property was made for a new stage of development. Today, the property houses The Jungle school, the HIA nature reserve and numerous micro business start ups. Fresh opportunities for impact from this secluded campus enliven the entire community! Since that time, through strategic partnerships, our organization has formed bases in Peru, Mexico, and Colombia. Our global focus continues to be ecological education for rural communities in poverty stricken areas and employment opportunities for the underprivileged. In addition, we host leadership trainings and promote children’s healthcare and nutrition. Our base is bustling with new projects related to forestry, agronomy, business and education. Understanding that change takes time and partnership, we are heavily invested in our local community and want to work together to create a brighter tomorrow that offers jobs, values based education that goes beyond the classroom, and conservation efforts that leave this planet better than the way we found it.